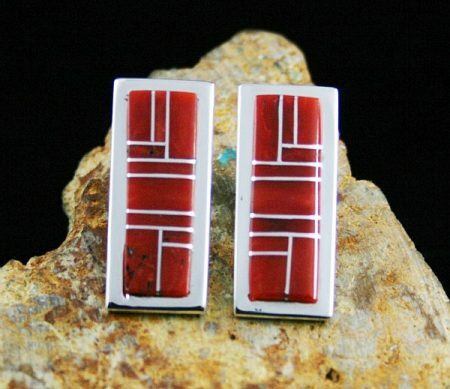 Navajo jeweler Tommy Jackson has created these gorgeous earrings out of rare gem grade natural Mediterranean coral. Each segment is finely cut and precisely separated with sterling silver spacers. The effect is eye-dazzling and elegant. 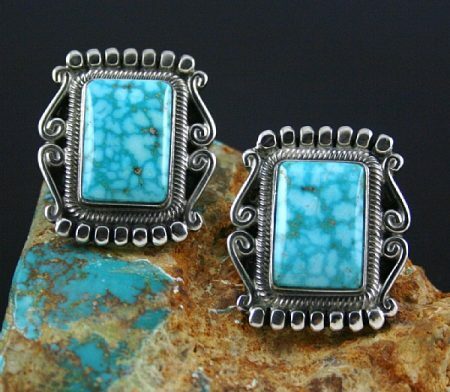 Navajo artist Terry Martinez has selected two perfectly matched high grade natural Turquoise Mountain spiderweb cabochons to create these gorgeous one of a kind earrings. The stones are blue sky blue with dark blue and tan webbing adding a cloud like appearance. The design is old style baroque with fine twist wire accents. 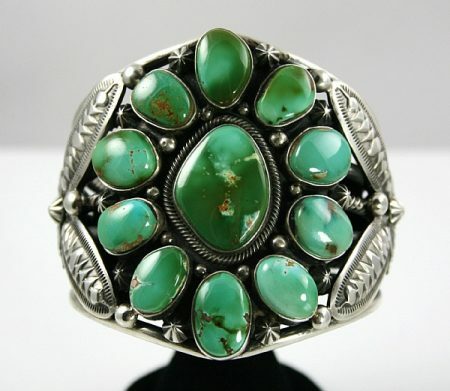 This vintage ring was hand made by Navajo jeweler Sam Piaso in the early 1970s. 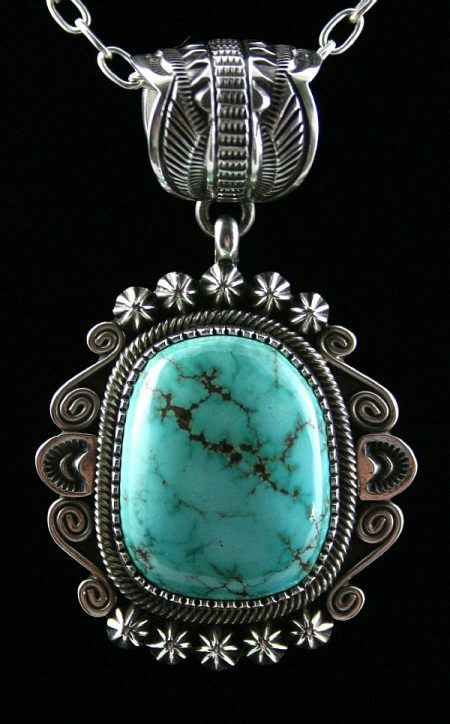 Sam set the piece with a lovely rare high grade natural Bisbee turquoise and placed it in a delicate sterling silver leaf to set it off. The stone exhibits a beautiful deep blue hue with dark reddish-brown matrix that is a classic representation from this mine. The ring is light and small, perfect for a slender finger. 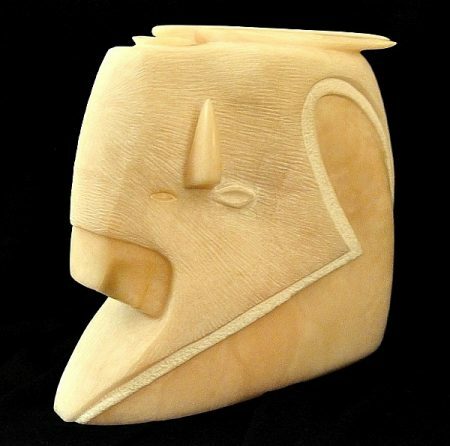 This amazing one of a kind sculpture was hand carved by award winning Jemez Pueblo artist, Victor Vigil. 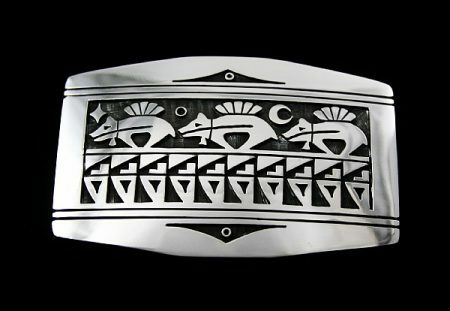 The design was inspired by the Nez Perce and the detail is spectacular. The artist precision cut the stunning facial features, choker, prayer feathers and hair with skill that few artists can master to this degree. 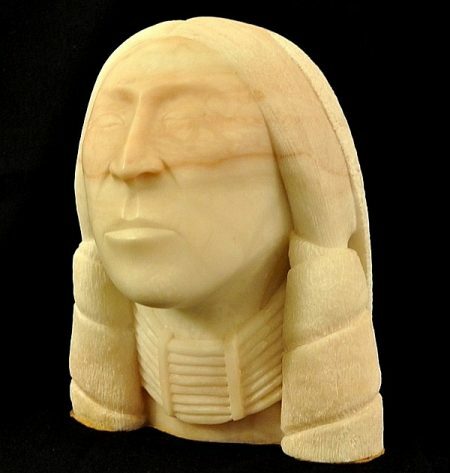 The variations in the rock layers compliment the piece to perfection with hues that accent the eyes of the face reminiscent of the paint used in ceremony. 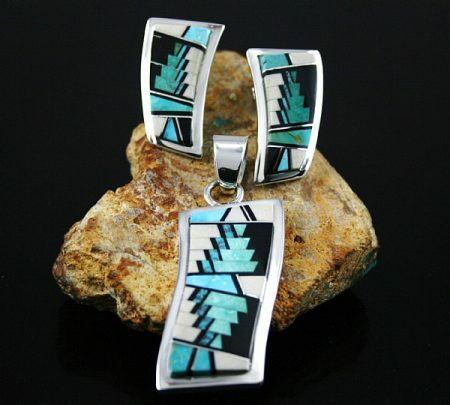 Premier Navajo inlay artist Tommy Jackson has created this beautiful pendant and earring set by using bright high grade natural segments of stone. Fossil ivory from Alaska, blue-green Royston turquoise from Nevada and old Blue Gem are all accented by black jade and thin strips of sterling silver. 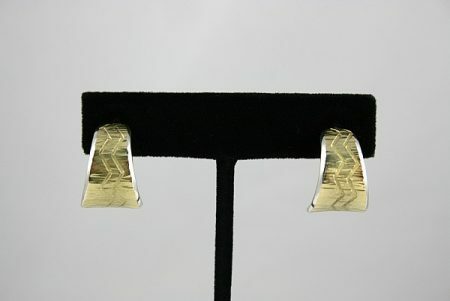 Navajo jewelers Tommy and Marie Jackson have created these incredible half hoop earrings. By inlaying natural malachite and coral for accent, the earrings are luminescent on the ears. 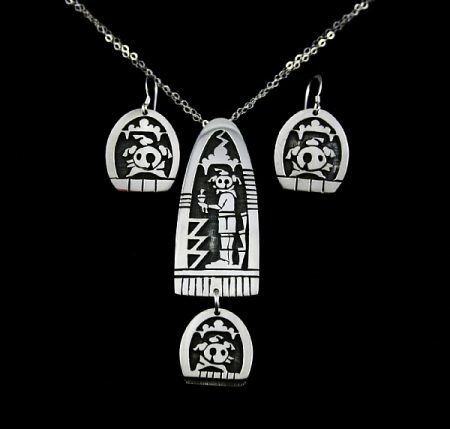 In addition the stones are raised on the silver and inlayed with difficulty on the curve. 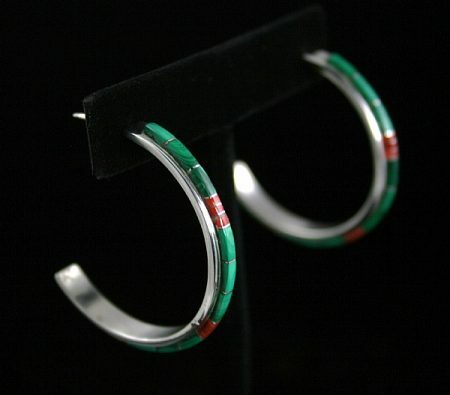 By inlaying natural malachite and two colors of picture jasper on a curve, Navajo master jewelers Tommy and Marie Jackson have created these marvelous hoop earrings. 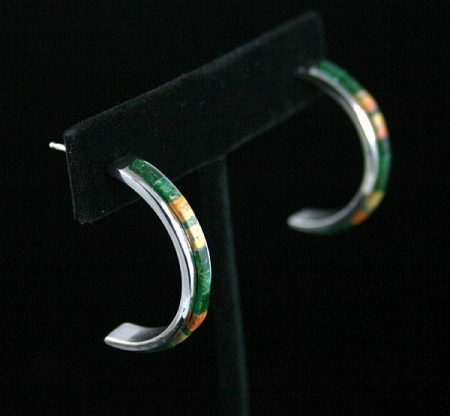 Each earring was made with elegant silverwork and the colors of the inlay include hues of deep green, tan and orange. 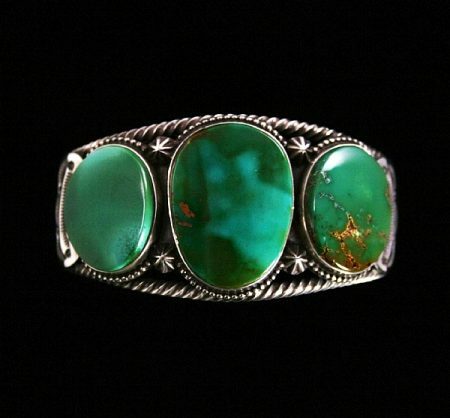 Award winning Navajo artist, Sammie Kescoli Begay, created this fabulous ring set with rare high grade natural Number Eight spiderweb turquoise. The cabochon is an elegant light blue with golden-brown and deep blue matrix. 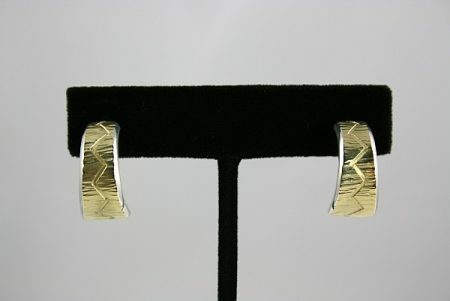 The artist also included exceptional detail in heavy gauge hand rolled and hammered ingot sterling silver. Petite droplets are displayed beneath the intricate hand chiseled bezel of the stone accompanied by beautiful hand twisted wire, coils of silverwork and six large drops as well. Deep stamp work is featured both on the upper and lower portions of the ring face and extends the full length of the shank with marvelous precision. 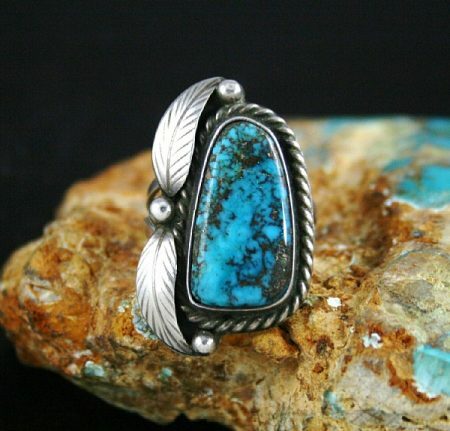 Hand made by award winning Navajo artist, Terry Martinez, this amazing piece is set with rare gem grade natural Royston turquoise from Nevada. The cabochons include exquisite hues of dark green with chocolate-brown matrix. The bracelet features exceptional design as well with both large and small droplets used as a border to the stones. Deep stampwork accents either side of the band which was made from a combination of both thick heavy gauge hand braided wire and smooth silverwork. 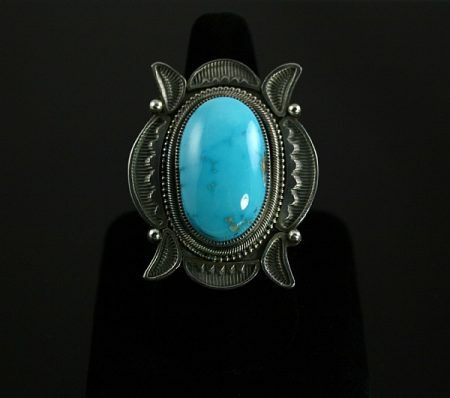 Created by award winning Navajo silversmith, Sammie Kescoli Begay, this beautiful ring is set with high grade natural Castle Dome turquoise from Arizona. The stone exhibits a wonderful high dome and is a stunning sky blue with deep blue and tan matrix. The artist employed a unique design that flares out around the outer edges of the ring face with intricate stampwork. Hand twisted wire is displayed around the bezel of the stone, accompanied by petite droplets with gorgeous patternwork on the shank as well. 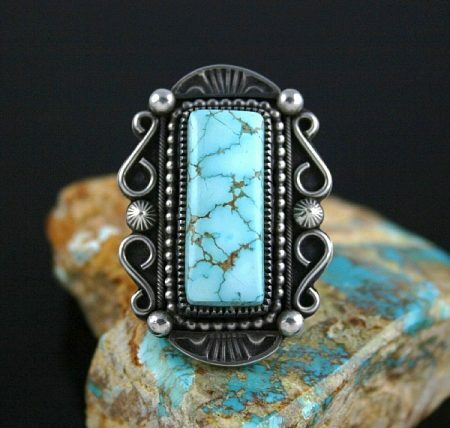 This incredibly gorgeous one of a kind piece hand fabricated by award winning Navajo artist Terry Martinez features a cluster of eleven high grade Royston turquoise cabochons. The stones all include hues of deep and light olive green with chocolate brown and tan matrix. The center cab of the piece is encircled with hand twisted wire followed by small drops. The outer grouping of stone is outlined with large droplets with star shaped stamps. The artist created the piece with a split shank design, with thick hand woven wire from one end to the next. Deep designs are portrayed on either side of the cluster with elaborate detail and exceptional design. A masterpiece hand crafted by an amazing artist. 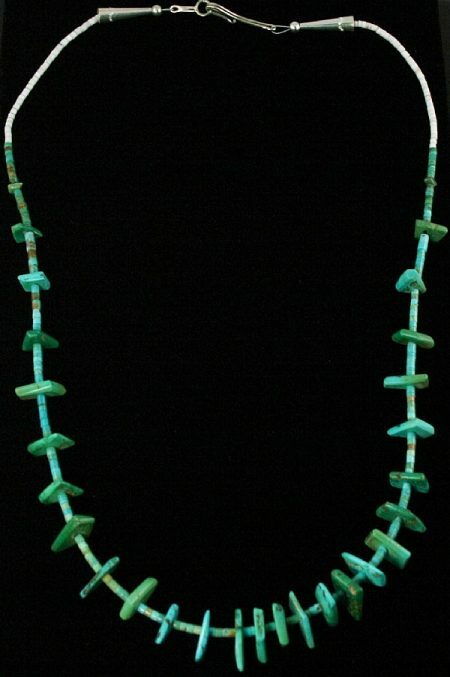 This gorgeous piece hand made by award winning Navajo artist Terry Martinez features a stunning rare Carico Lake turquoise cabochon. The stone is a beautiful light blue with chocolate brown matrix. Smooth to the touch the stone has a very nice high dome encircled with fine bezel work and hand twisted wire. 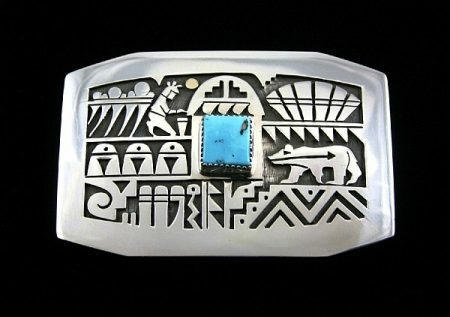 The hammered ingot silver work of the piece is elaborate with deep stamping on each of the large droplets as well as on either side of the stone. The item also includes a nice large bale with intricate detail. The chain portrayed with this piece is for display purposes only.